Black Powder Rulebook: Albion Triumphant Part 1: The Peninsular Campaign Chronicling the Flanders and Peninsular Campaigns during the Napoleonic Wars, Albion Triumphant is the first of two books covering the battles involving the British forces. Of course, it also looks at the French, Spanish and Portugese in depth too! This full-colour 112 page supplement is full of army lists, scenarios, and background and is available now! Napoleonic army lists, background, troop stats and scenarios make this an absolute must for lovers of Black Powder, of Napoleonic gaming or simply of gloriously produced wargaming books! 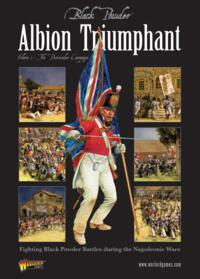 You will need the Black Powder rulebook to use Albion Triumphant.